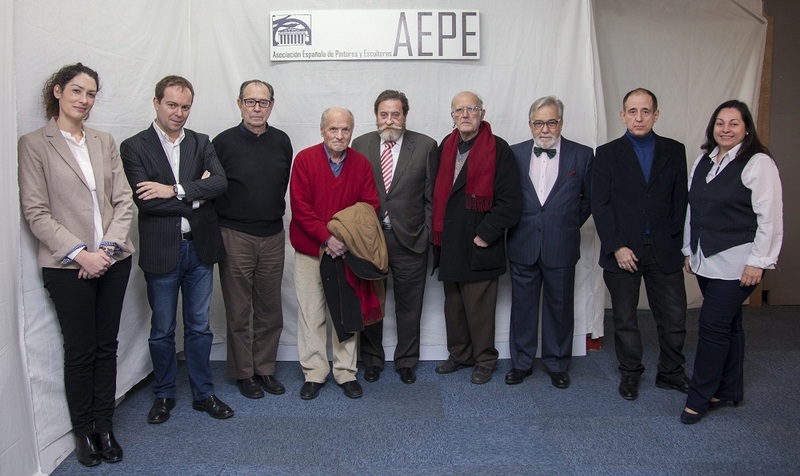 The President of the Spanish Association of Painters and Sculptors, José Gabriel Astudillo López, proposed to the the Board of Directors meeting of the 10th of January, 2014, to approach the Queen Sofia Extraordinary Award in a more befitting manner than usual, as it had been part of the Salón de Otoño and opened only to members, so far. 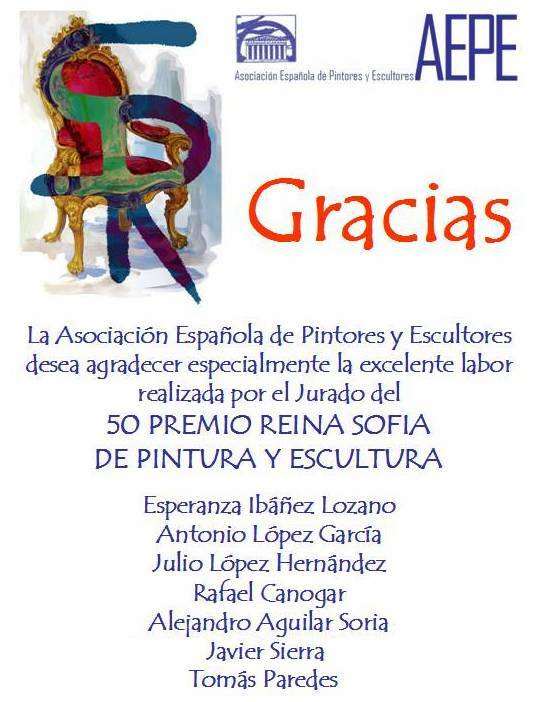 The Queen Sofía Extraordinary Award of the Spanish Association of Painters and Sculptors is the first and oldest of the five awards under the same name that are held in Spain. Not until 1981 had there been the Ministry of Health’s Queen Sofía Award of the Royal Trust for the Disabled. The Queen Sofía Award for Musical Composition of the Ferrer-Salat Music Foundation was set up in 1982. The Queen Sofía Awards by CREFAT Spanish Red Cross Foundation against drug addiction was established in 1991. 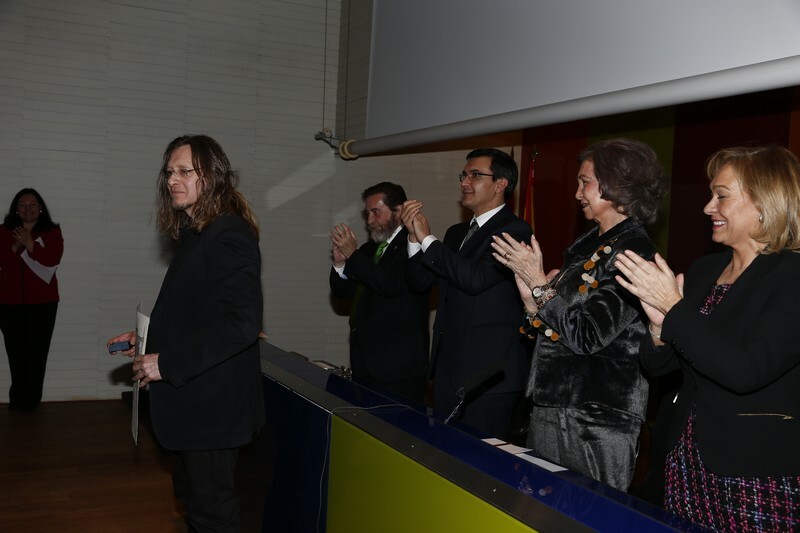 Finally, the Queen Sofía Award of Latin-American Poetry, by Salamanca University and the National Heritage was created in 1992. Therefore, our institution has the honour and privilege of having had the Princess Sofía Award since 1964. It was instituted as the highest reward, after the Honourary Medal, for the opening of the Salón de Otoño of that year. 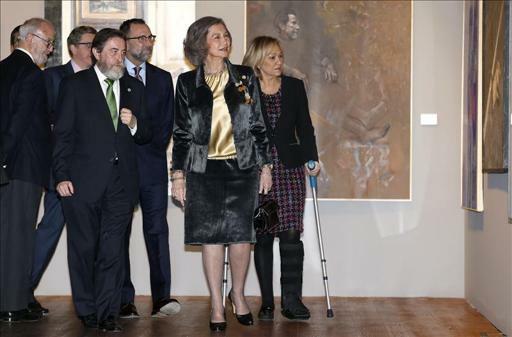 Prince D. Juan Carlos and Princess Doña Sofía attended the XXXV Salón de Otoño where the award was granted for the first time. 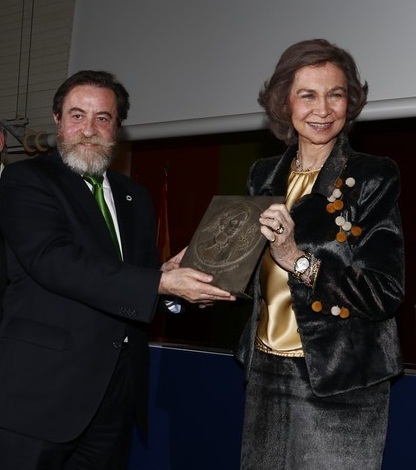 Her Royal Highness Princess Sofía gratefully accepted the Honorary Presidency of the Spanish Association of Painters and Sculptors. Her presence at these and other events organized by the Association has been frequent ever since then. The most prestigious honorary award amongst the Association members became the Queen Sofía Extraordinary Award in 1980, and that is the name it has been carrying since then. The artists who receive it, beyond styles and tendencies, are a magnificent sample of diversity and freedom, both exponents of Art for the last third of last century to the present. 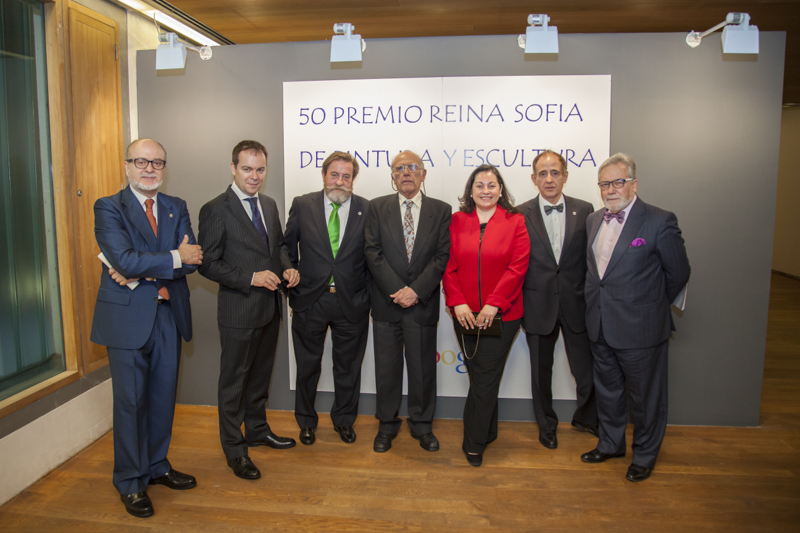 2014 marks the 50th anniversary of Queen Sofía Award, the oldest in Spain. 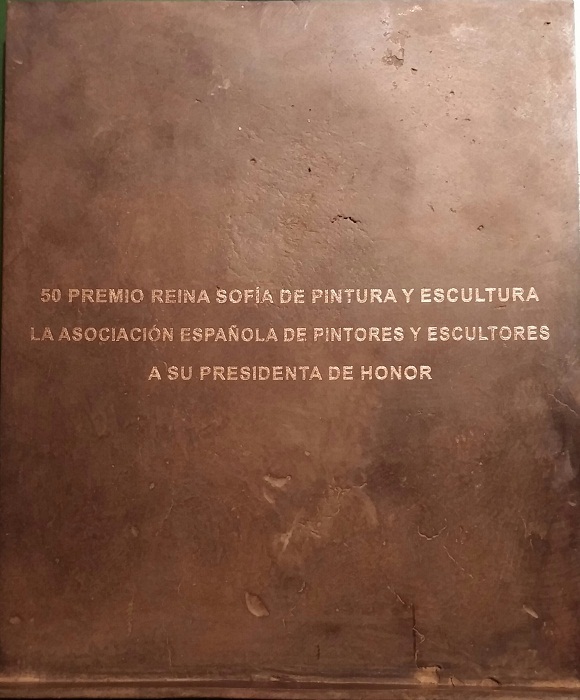 The President of the Spanish Association of Painters and Sculptors, José Gabriel Astudillo, has managed to renew the award which will be named from now on Queen Sofía Award of Painting and Sculpture, as one of his priorities since he took charge was to increase its prestige in accordance with that of the century old Association. The award has also been financially upgraded to reach the amount of €29,0000, which is one of the highest in Spain at the present time. 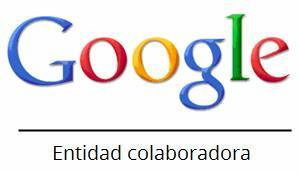 Google sponsors it and is open to all Spanish artists. This achievement is on line with the vision the founders of the Spanish Association of Painters and Sculptors had: All Art run by Artists (‘El Arte todo regido por artistas’). 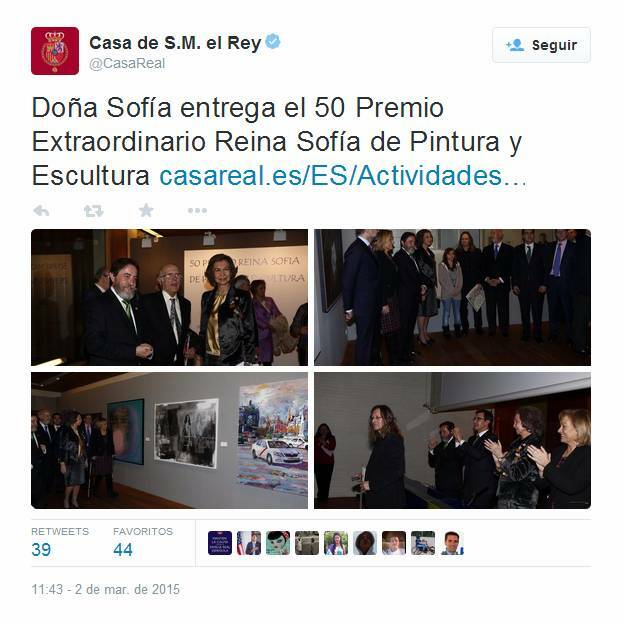 Furthermore, the Queen Sofía Award of Painting and Sculpture given by the Spanish Association of Painters and Sculptors will provide a relevant contribution to the world of creativity, for which Her Majesty Queen Doña Sofía has always had a weakness. We, at the Spanish Association of Painters and Sculptors, stand for creativity, for beauty with passion, for generous work, for reaching human beings with original works of art in order to achieve a deep moving admiration of them. José Gabriel Astudillo had this project a year ago According to his own words: “if we want to be great we must think big. Mediocrity does not require talent but resignation” With this thought in mind, persistence and the ambition for a job-well-done, the project has become a present reality. 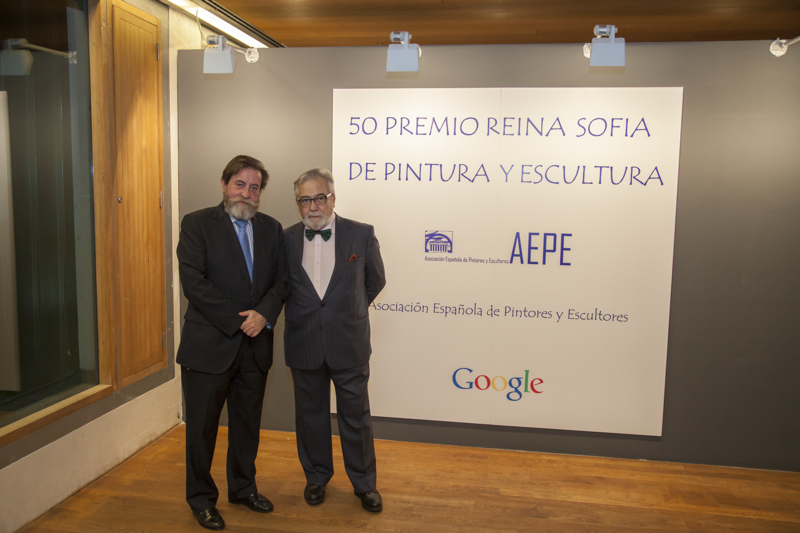 Tuesday February 10, 2015 meeting of the Jury Selection and qualification of 50 Queen Sofia Prize for Painting and Sculpture that summons the Spanish Association of Painters and Sculptors and has the significant participation of Google took place. The jury consisted of artists like Manchego painter Antonio Lopez of Madrid sculptor Julio López, painter, sculptor and engraver Rafael Canogar, painter, sculptor and multidisciplinary artist Alejandro Aguilar Soria, author of the visual image of the Prize, the journalist and writer Javier Sierra, President of the National Association of Art Critics, Tomás Paredes and Hope Ibáñez, Manager of Policy and Public Affairs at Google, acting as Chairman of the José Gabriel López Astudillo and as Secretary Mª Dolores Barreda Perez, both with voice but no vote and on behalf of the Spanish Association of Painters and Sculptors, organizer of the event. “It was extremely difficult Asutidllo- continues to reward a single work, with such a high number, which place the award as one of the most important of all those held in Spain, and has also been particularly difficult to select the work that is will display in the exhibition, considering the high participation we have achieved “. 50 Reina Sofia Prize has been awarded a unique work of 20,000 euros and has selected a total of 53 of the best pieces submitted to the competition in these two modalities, which will be exhibited in the magnificent exhibition of 50 REINA SOFIA PRIZE OF PAINTING AND SCULPTURE that will open next day February 23, 2015, at 19 h. in the Exhibition Hall The Eagle Regional Archives of the Community of Madrid. However, not until the day March 2, 2015, when SM Queen Sofia chairing the event of failure of the jury and the award ceremony that bears his name, which will be attended by various personalities from the world of arts and letters, as well as the heads of Google, the collaborating institution of the Prize, the Jury members and the organization. Exposure REINA SOFIA 50 PRIZE OF PAINTING AND SCULPTURE will remain open until March 10, and will be the first major event that anticipates the frenetic cultural activity that will make the city of Madrid with the ARCO fair. The Spanish Association of Painters and Sculptors opens on Monday February 23 at 19 h. the exhibition of selected works in 50 REINA SOFIA PRIZE OF PAINTING AND SCULPTURE organized by this ancient institution, in collaboration with Google. The exhibition will remain open until March 10 at the Exhibition Hall “The Eagle” of the Regional Archives of the Community of Madrid, has a total of 53 works (37 paintings and 16 sculptures) among which is the work awarded this year, and the winner will not be announced until next March 2 in a ceremony presided by SM Queen Sofia. The exhibition of 50 Queen Sofia Prize for Painting and Sculpture is scheduled to precede the acts that will make Madrid the epicenter of Contemporary Art at the international level, holding four fairs and over 150 exhibits. Essential in the international calendar of contemporary art. The artists selected were: Teruhiro Ando, ​​Augusto Arana, Cuca Arsuaga Perhaps, Carlos Asensio, Pepe Carter, Michael Coca Leicher, María de Iracheta, Carlos Ballesteros, Beatriz de Bartolomé, Maribel Binimelis, Roberto Canduela, Francisco Rafael Casado, Sonia Home Mary Cemeli, Teddy Cobeña, Natalia lace, Leovigildo Christopher, Encarnación Sunday, Isabel Figueroa Astarloa, Lucie Geffré, Isabel Gómez Moreno, Fanny Grau, Teresa Guerrero Serrano, Pedro Hernandez, Albano Hernandez, Vicente Herrero, Carla Hoet, Santos Hun, Innocence Isabel, Josep Juan Manuel Moraleda, Juan Manuel López-Reina, Julian Maroto, Manuel Martí Moreno, David Martin Rus, Ana Martínez Córdoba, Elvira Mateos, Matthias Alvaro Jimenez, Victoria Moreno, Carlos Muro, Miguel Oliver, Orti, Juan de Cross Pallares, Esther Pizarro, Docha Riobóo, Chema Rodrigo Garcia, Plácido Rodríguez Bonnin, Pilar Sagarra Moor, Pablo Vidal Sanchez, Oscar Seco, Francisco Segovia, Paul Tardáguila, Juan José Vicente Ramirez and Charles Villeneuve. The exhibition is an excellent proposal of the best Spanish artists, some highlights and other novel, which coincided with the presence in Madrid of the International Public important and has the support of specialized Jury gathered for this important award, consisting of José Gabriel López Astudillo President of the Spanish Association of Painters and Sculptors, Mª Dolores Pérez Barreda, General Secretary of the Spanish Association of Painters and Sculptors, Hope Ibáñez, Manager of Google, the painter Antonio Lopez, Julio López sculptor, painter, sculptor and engraver Rafael Canogar, painter, sculptor and multidisciplinary artist Alejandro Aguilar Soria, author of the visual image of the Prize, journalist and writer Javier Sierra and President of the National Association of Art Critics, Tomás Paredes. Date: From February 23 to March 10, 2015. 19 h.
Regional Archives of the Community of Madrid. Jury’s decision: March 2, 2015. 19 h.
Later you will visit the exhibition of 53 works selected for the occasion. S.M. 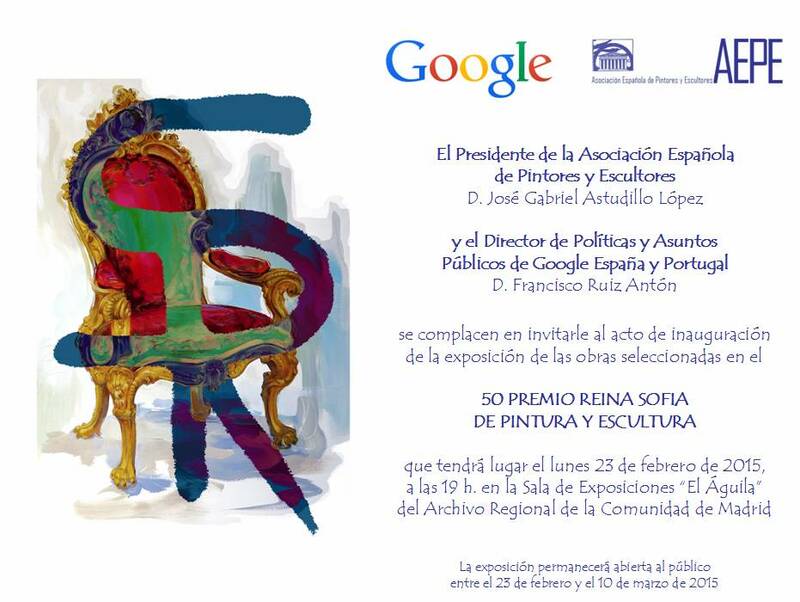 Queen Sofia preside on Monday March 2 at the Auditorium of the Regional Archives of the Community of Madrid the event which will be released the jury’s decision and carry out the delivery of 50 Queen Sofia Prize for Painting and Sculpture organized by the Spanish Association of Painters and Sculptors, in collaboration with Google. 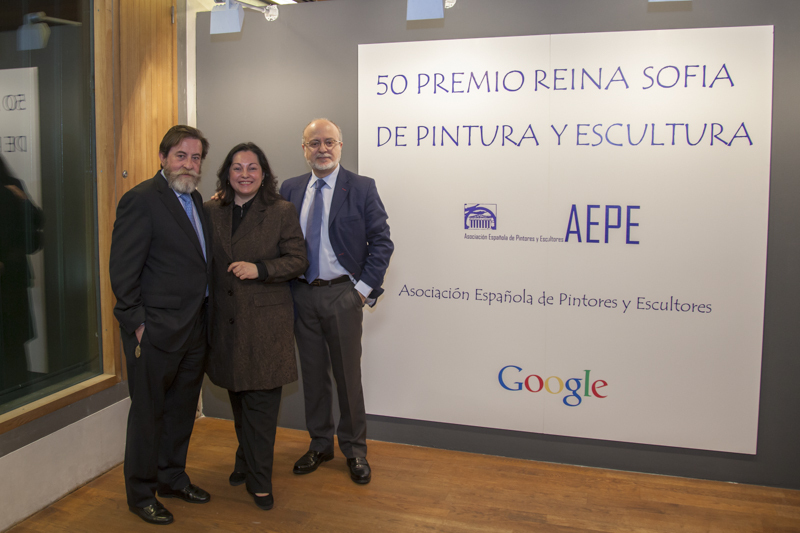 The ceremony was attended by the President of the Spanish Association of Painters and Sculptors, José Gabriel Astudillo Lopez, Director of Policy and Public Affairs of Google Spain and Portugal, Francisco Ruiz Antón and the President of the Assembly of Madrid, among other authorities. 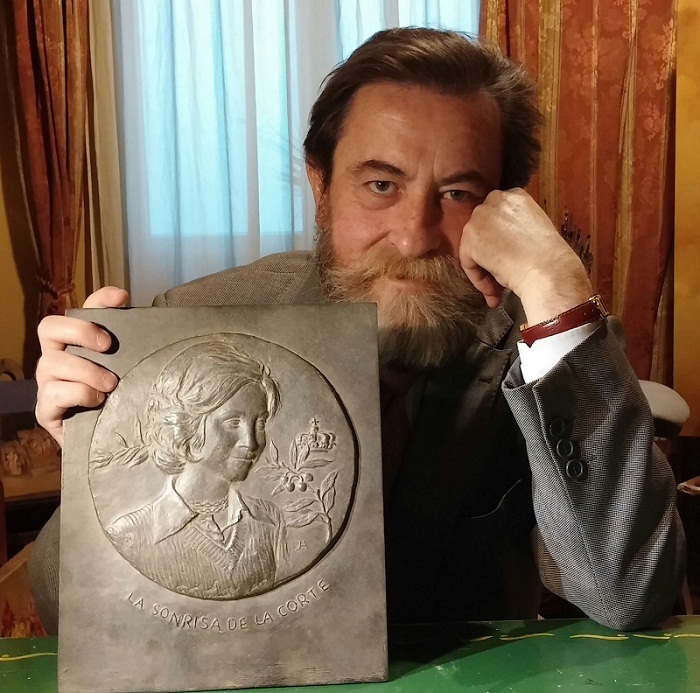 The event is expected to deliver a sculptor Julio López SM Queen Sofia a commemorative medal by him in the 60s and has been cast in bronze especially for this fiftieth anniversary, to remember that he is Honorary President of the Spanish Association of Painters and Sculptors. The call REINA SOFIA 50 PRIZE OF PAINTING AND SCULPTURE has proven to be an excellent proposal of the best Spanish artists, some highlights and other novel, which has received the support of specialized Jury gathered for this important award, consisting of José Gabriel Astudillo Lopez, President of the Spanish Association of Painters and Sculptors, Mª Dolores Pérez Barreda, General Secretary of the Spanish Association of Painters and Sculptors, Hope Ibáñez, Manager of Google, the painter Antonio Lopez, Julio López sculptor, painter, sculptor and Rafael Canogar engraver, painter, sculptor and multidisciplinary artist Alejandro Aguilar Soria, author of the visual image of the Prize, journalist and writer Javier Sierra and President of the National Association of Art Critics, Tomás Paredes. 50 REINA SOFIA PRIZE OF PAINTING AND SCULPTURE is worth 20,000 euros to a single work, becoming the second best prize endowed with Spain. 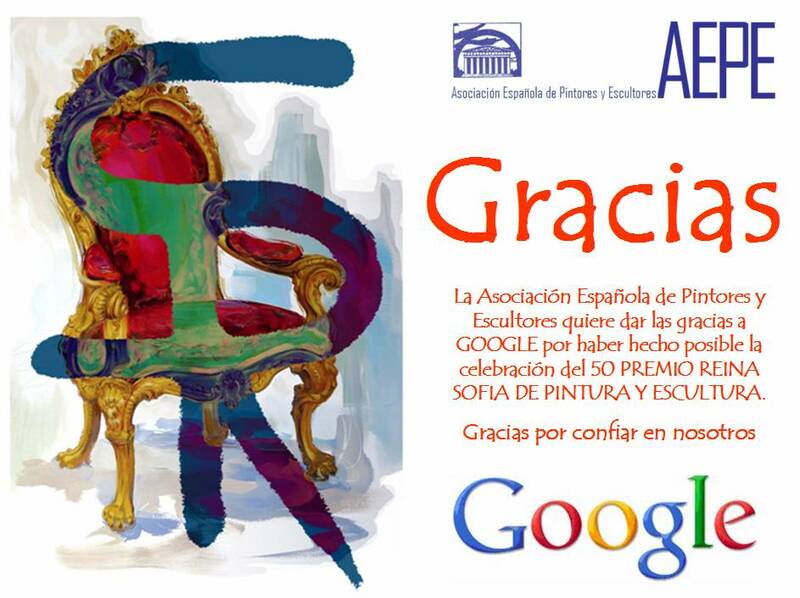 Google is the entity that has worked to make an award to date was reserved only for members of the Spanish Association of Painters and Sculptors possible. The artists selected for the exhibition were: Teruhiro Ando, ​​Augusto Arana, Cuca Arsuaga Perhaps, Carlos Asensio, Pepe Carter, Michael Coca Leicher, María de Iracheta, Carlos Ballesteros, Beatriz de Bartolomé, Maribel Binimelis, Roberto Canduela, Francisco Rafael Casado Sonia Casero, Mary Cemeli, Teddy Cobeña, Natalia lace, Leovigildo Christopher, Encarnación Sunday, Isabel Figueroa Astarloa, Lucie Geffré, Isabel Gómez Moreno, Fanny Grau, Teresa Guerrero Serrano, Pedro Hernandez, Albano Hernandez, Vicente Herrero, Carla Hoet, Santos Hun, Innocence Isabel, Josep Juan Manuel Moraleda, Juan Manuel López-Reina, Julian Maroto, Manuel Martí Moreno, David Martin Rus, Ana Martínez Córdoba, Elvira Mateos, Alvaro de Matías Jiménez, Victoria Moreno, Carlos Muro, Miguel Oliver, Orti Juan de la Cruz Pallares, Esther Pizarro, Docha Riobóo, Chema Rodrigo Garcia, Plácido Rodríguez Bonnin, Pilar Sagarra Moor, Pablo Vidal Sanchez, Oscar Seco, Francisco Segovia, Paul Tardáguila, Juan José Vicente Ramirez and Charles Villeneuve. Date: March 2, 2015. 19 h.
S.M. 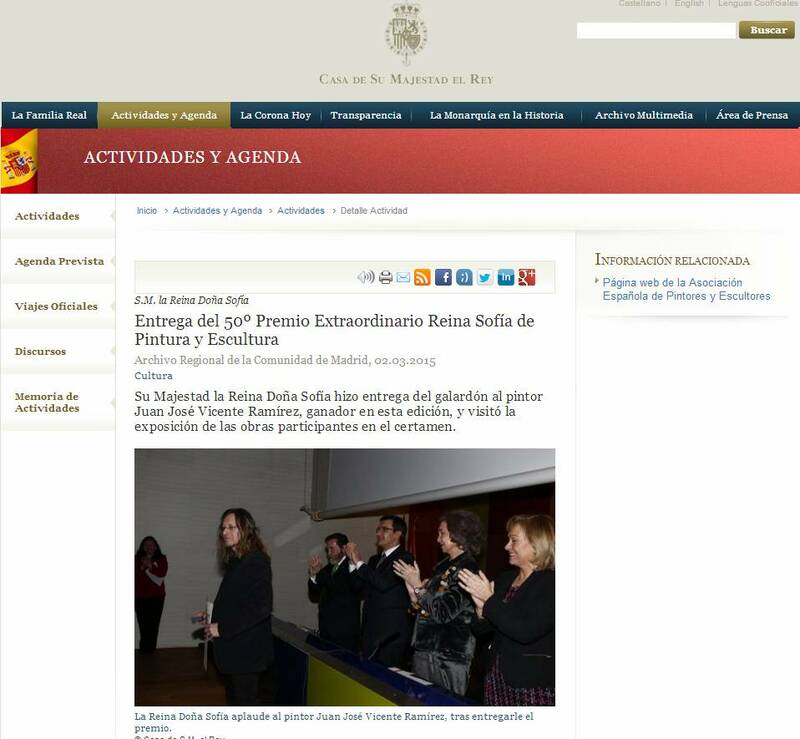 la Reina doña Sofía presidió el lunes 2 de marzo el acto del fallo del Jurado e hizo entrega del Premio que organiza la Asociación Española de Pintores y Escultores, con la colaboración de Google. Posteriormente visitó la exposición que reúne las 53 seleccionadas para la ocasión. SS.MM. los Reyes don Juan Carlos y doña Sofía son los Presidentes de Honor de la centenaria entidad desde 1964. S.M. la Reina doña Sófía presidió el lunes 2 de marzo en el Salón de Actos del Archivo Regional de la Comunidad de Madrid el acto en el que se dio a conocer el fallo del Jurado y se hizo entrega del 50 Premio Reina Sofía de Pintura y Escultura que organiza la Asociación Española de Pintores y Escultores, en colaboración con Google. Al acto asistieron el Presidente de la Asociación Española de Pintores y Escultores, José Gabriel Astudillo López, el Director de Políticas y Asuntos Públicos de Google España y Portugal, Francisco Ruiz Antón, el Embajador de los Estados Unidos de América en España, James Costos, el Presidente de la Asamblea de Madrid, José Ignacio Echeverría, el Secretario de Estado de Relaciones con las Cortes, José Luis Ayllón, la Consejera de Emleo, Turismo y Cultura de la Comunidad de Madrid, Ana Isabel Mariño, la Viceconsejera de Turismo y Cultura, Carmen González, Javier Gutiérrez Vicen, Presidente de VEGAP, el Director del Museo Thyssen, Evelio Acevedo y José Manuel Gómez Bravo, Director del Grupo Prisa, entre otras muchas personalidades. Además, se encontraban también presentes Mª Dolores Barreda Pérez, Secretaria General de la Asociación Española de Pintores y Escultores, que actuó como Secretaria del Jurado, y otros miembros del mismo como Julio López Hernández, Alejandro Aguilar Soria, Esperanza Ibáñez, Javier Sierra y Tomás Paredes Romero. S. M. la Reina doña Sofía saludó aparte a los miembros del Jurado y conversó con ellos, muy interesada en la difícil elección que han debido afrontar en la deliberación final del premio. La sesión comenzó con unas palabras de Francisco Ruiz Antón, Director de Políticas y Asuntos Públicos de Google España y Portugal, en las que justificó su apoyo a la Asociación Española de Pintores y Escultores y a la celebración del Premio Reina Sofía. Acto seguido, S.M. la Reina dio la palabra a José Gabriel Astudillo López, Presidente de la Asociación Española de Pintores y Escultores, quien agradeció la presencia de la Presidenta de Honor, y no olvidó mencionar el apoyo recibido por Google, al magnífico Jurado reunido para la ocasión, a la Fundición Codina, a su Junta Directiva y tuvo cariñosas palabras para la Secretaria General, a quien felicitó por el éxito de tan espléndido desarrollo del premio. Doña Sofía dio la palabra a Mª Dolores Barreda Pérez, Secretaria General de la Asociación Española de Pintores y Escultores, que actuó además como Secretaria del Jurado, y quien hizo lectura del acta, en la que se recoge que han quedado finalistas las obras de Albano Hernández Rodríguez, Pepe Carretero, Teresa Guerrero Serrano, Carlos Muro y Miguel Oliver. Finalmente, comunicó que el artista ganador del 50 PREMIO REINA SOFIA DE PINTURA Y ESCULTURA ha sido Juan José Vicente Ramírez, por su obra titulada “Interior Woodwork”, una pintura de técnica mixta sobre madera, de 150 x 150 cms. 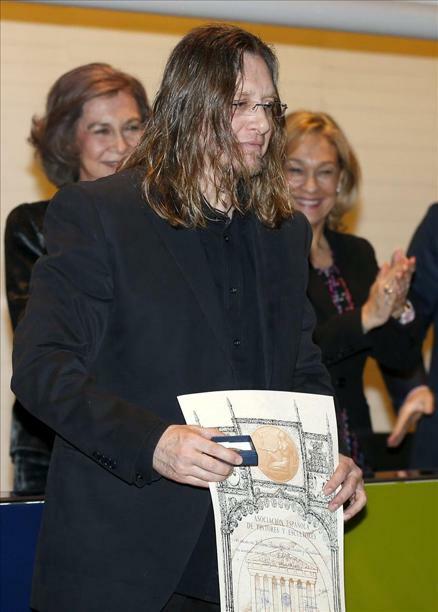 Vicente es un asiduo a los certámenes de pintura rápida, en los que posee numerosísimos premios y distinciones (al final de este dossier se puede consultar su trayectoria profesional). Entonces S.M. la Reina doña Sofía hizo entrega al madrileño del diploma y medalla acreditativos ante el aplauso general de una sala abarrotada y tomada por los medios de comunicación, que respondieron muy bien a la asistencia de S.M. a uno de los actos por los que siente más cariño. Tras desvelar el nombre del premiado, el escultor Julio López dirigió unas palabras en las que explicaba el regalo que José Gabriel Astudillo López, como Presidente de la Asociación Española de Pintores y Escultores, entregó a S.M. la Reina doña Sofía. 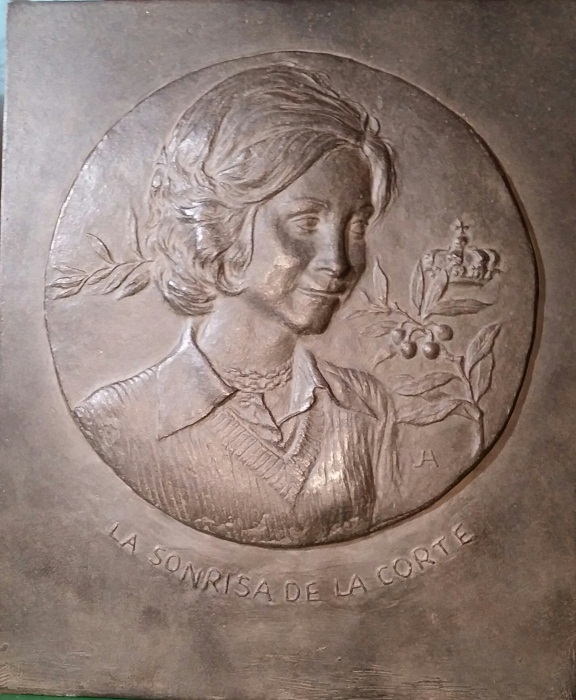 Se trataba de una Medalla conmemorativa realizada por él en los años 60 y que se ha fundido en bronce especialmente para este cincuentenario, como recuerdo a la que es Presidenta de Honor de la Asociación Española de Pintores y Escultores. La Reina se mostró realmente sorprendida y emocionada, puesto que nada sabía del regalo tan entrañable de quien tanto admira, y fuera de protocolo, quiso agradecer brevemente al autor y a la Asociación Española de Pintores y Escultores, el homenaje recibido, mostrando su cariño hacia la histórica y centenaria entidad. Después S.M. la Reina doña Sofía visitó la exposición y charló y posó con los artistas, interesándose vivamente por sus creaciones, preguntándoles y comentando con ellos cada detalle, que no descuidó lo más mínimo. Los artistas seleccionados para la exposición han sido: Teruhiro Ando, Augusto Arana, Cuca Arsuaga Acaso, Carlos Asensio, Pepe Carretero, Michael de Coca Leicher, María de Iracheta, Carlos Ballesteros, Beatriz de Bartolomé, Maribel Binimelis, Roberto Canduela, Francisco Rafael Casado, Sonia Casero, María Cemeli, Teddy Cobeña, Natalia Cordón, Leovigildo Cristóbal, Encarnación Domingo, Isabel Figueroa de Astarloa, Lucie Geffré, Isabel Gómez Moreno, Fanny Grau, Teresa Guerrero Serrano, Pedro Hernández, Albano Hernández, Vicente Herrero, Carla Hoet, Santos Hun, Inocencia Isabel, Josep Manuel Juan Moraleda, Juan Manuel López-Reina, Julián Maroto, Manuel Martí Moreno, David Martín Rus, Ana Martínez Córdoba, Elvira Mateos, Álvaro de Matías Jiménez, Victoria Moreno, Carlos Muro, Miguel Oliver, Orti, Juan de la Cruz Pallarés, Esther Pizarro, Docha Riobóo, Chema Rodrigo García, Plácido Rodríguez Bonnin, Pilar Sagarra Moor, Pablo Vidal Sánchez, Oscar Seco, Francisco Segovia, Pablo Tardáguila y Charles Villeneuve. 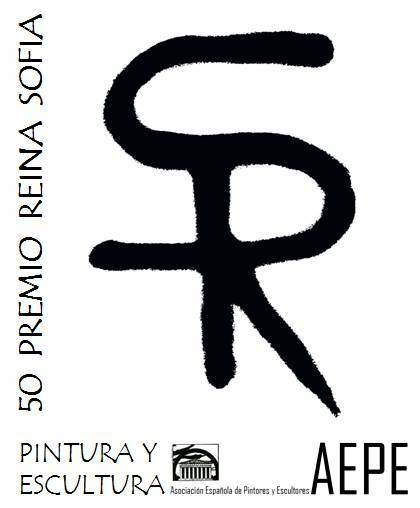 El Premio Reina Sofía es el galardón honorífico de más prestigio entre los asociados. El Premio Princesa Sofía se creó para los Salones de Otoño en 1964 y nació como la más alta recompensa concedida en los mismos, después de la Medalla de Honor. Se otorgó por primera vez en el XXXV Salón de Otoño celebrado en el Palacio del Retiro, al que asistieron los Príncipes don Juan Carlos y doña Sofía. 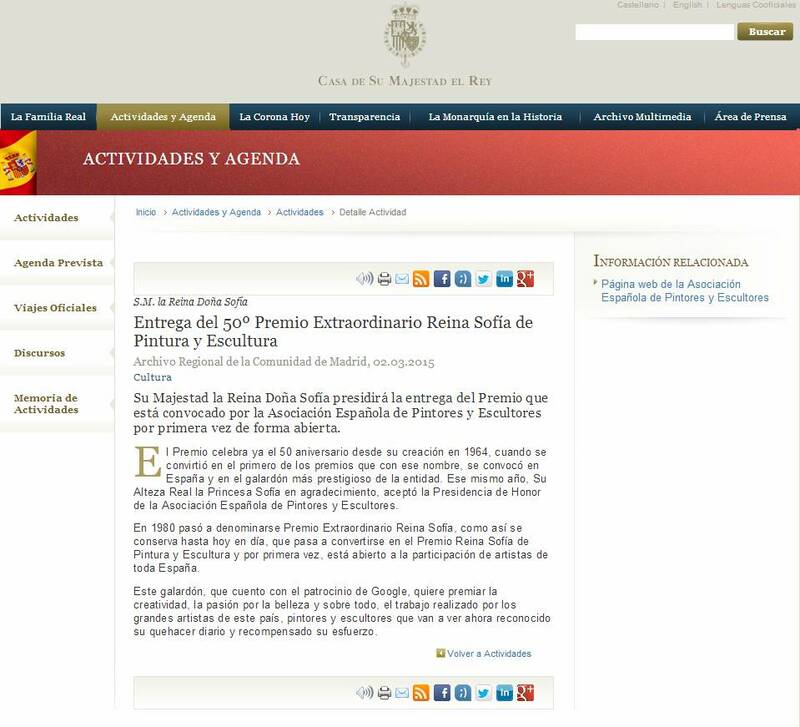 Ese mismo año, Su Alteza Real la Princesa Sofía en agradecimiento, aceptó la Presidencia de Honor de la Asociación Española de Pintores y Escultores, siendo frecuente a partir de entonces su presencia en estos y otros actos asociativos. En 1980 pasó a denominarse Premio Extraordinario Reina Sofía, como así se conserva hasta hoy en día. Los artistas premiados, más allá de estilos y tendencias, constituyen en su conjunto un magnífico exponente de la diversidad estilística y la libertad en la que se viene moviendo el arte desde el último tercio del pasado siglo hasta nuestros días.